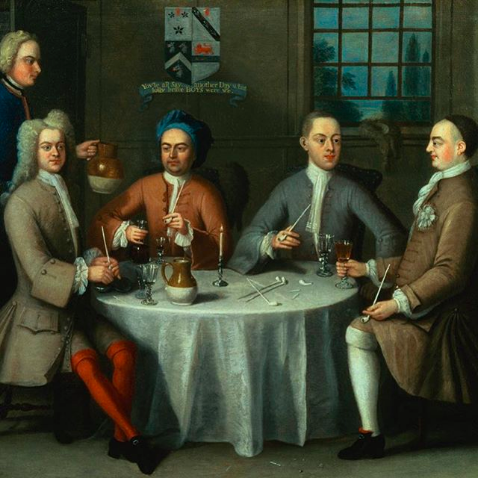 “A Group Portrait of Sir Thomas Sebright, Sir John Bland and Two Friends” is a 1723 wine-themed painting by Benjamin Ferrers (1695–1732), born in London and deaf and mute from birth. Sir Thomas Sebright, 3rd Baronet, was a Worcestershire man (like me). His son – the 4th Baronet depicted here – was a noted Parliamentarian, as was Sir John Bland. So relaxed are the gentlemen that three of them have removed their wigs. One of the wigs has been left on the window ledge to get some fresh air into it. A servant brings a pitcher of wine – probably taken straight from a cask in the cellar – to replenish the drinks. Wearing a velvet cap, Bland holds a decanter of red wine and points to it, as if he is commenting on the wine.